A strange, pseudo-mythological creature whose sole purpose for existence is to act as bait for authors, storytellers, and roleplayers everywhere. It's an odd term, plotfish is. And more than once, I've heard a confused onlooker wonder just what the hell it means. I can't tell you where I found it — Hell, I might've just made it up one day. (But, really, I don't think it's my creation… I'm almost positive someone else said it first.) But, I have found it an incredibly useful and uniquely awesome term. I mean, think about it: Plotfish. Say the word aloud. "Plotfish!" It just sounds fun — like an onomatopoeia that took a weird left turn somewhere near the Secret Garden, and ended up at the bottom of Mother Goose's basket. 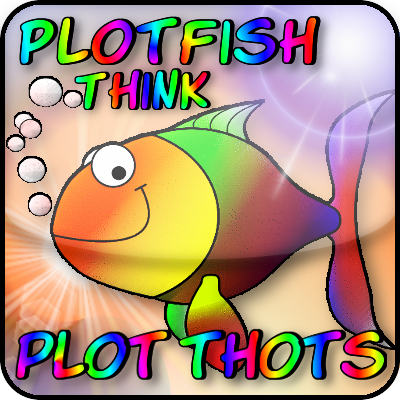 We on the TP team swear by plotfish. (We do. Honest. As in: "Frak! It's another plotfish!") We toss 'em about like confetti, when we can. We hide 'em like Easter eggs, tucked snugly in behind a casual scene or under an errant pose. They're all over the place, if you really look. Are you getting the picture, yet? Plotfish. We has 'em. You wants 'em. Trust me on this one.